Mine was labeled as 6th Avenue. I assume the cross street is Penn, but don’t know the old landmarks well enough to tell. @jonawebb and @rustyred, thanks for the pictures! It looks neat and far less polluting than buses, at least along the roadways, anyway. Power generally ain’t clean. The downside of having electric street cars, and it’s a big one for me, are all the overhead power lines. I prefer my urban environments to be without exposed wires. We can’t have it all, can we? Looks like Wood, at a guess. Based on the rise in the distance, pre-1912 (the year of the ‘hump cut’ that lowered the Grant Street area), though that could just be the odd perspective. STREETCAR…trams are for limeys…’n’at…. (maybe trolley if you are in Mr. Rodger’s Neighborhood)…STREETCAR…. 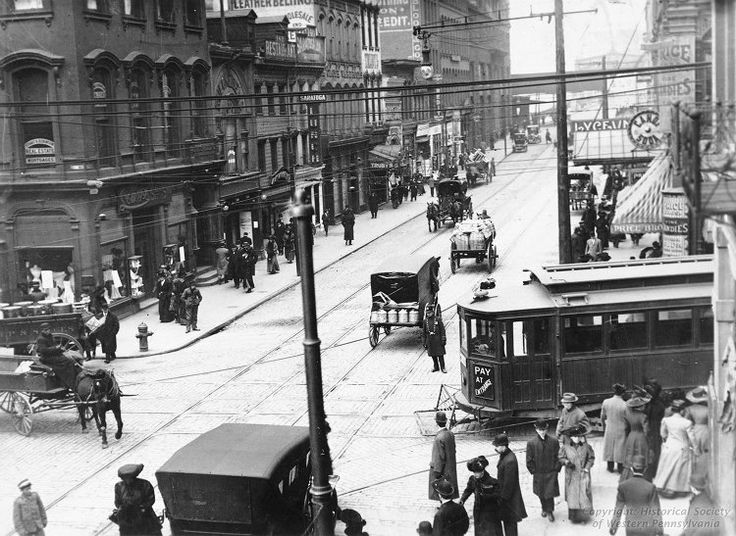 Pretty sure the 1915-ish photo above is Penn Ave looking west from about 7th Street. The Lyceum Theater is clearly visible on the right. The current O’Reilly is on that site. Remember, though, that we had on-street trolleys downtown until July 5, 1985, the day the T opened. This just popped up on Facebook. Looking up Penn Ave at Sixth St, toward Seventh. The camera is about where Six Penn is now. Circa 1964. Current StreetView of about the same spot. The Roosevelt’s overhang is pretty much unchanged in half a century. You can still see the trolley rails some places. Most famously at the Braddock entrance of frick park by the parkway. I bet a lot of the bricks+rails were just paved over. Some Pgh curbs have a metal covering over them. Never knew what it was for but figured maybe for the trolleys so they didn’t ruin the stone curbs? I always figured it was just to extend the life of the curb against normal wear and tear from trucks and buses and such running over it. Trolleys wouldn’t touch the curb normally, would they? Penn Avenue is on the paving schedule for 10/9. 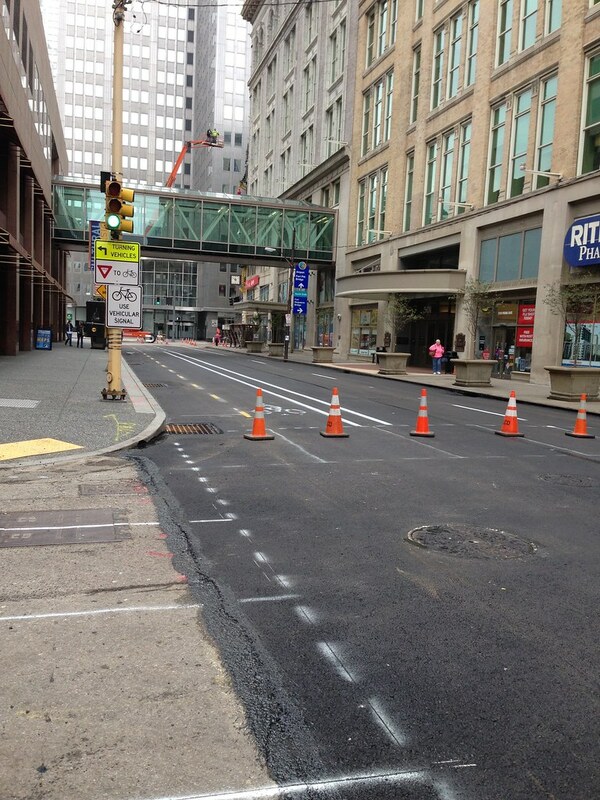 I’ve heard from one business owner downtown on Liberty Ave and 6th that Visit Pittsburgh went to his office to inform him of the upcoming cycle track installation on Penn. Presumably they’ve alerted other businesses in the area as well. At the very least, the tenants of the Highmark building should be well aware of this by now, given that Visit Pittsburgh has its offices there. I wish that the City would start putting up signs at the intersection of Stanwix and Penn (and really, anywhere in that vicinity) announcing the upcoming change in traffic pattern. That left turn from southbound Stanwix onto eastbound Penn is popular. Some advance warning would help reduce the confusion that will surely come with this change. Also, I noticed a counter on the road, to presumably count cars, in the Strip District. Looks like the city will be comparing bikes to cars on that road. PDP’s weekly newsletter had an update on the bike lane today that is …. a little less optimistic than @jason-pgh. Many of you have probably been wondering when the final block of the Penn Avenue Bike Lane between Sixth and Stanwix Streets will be completed. 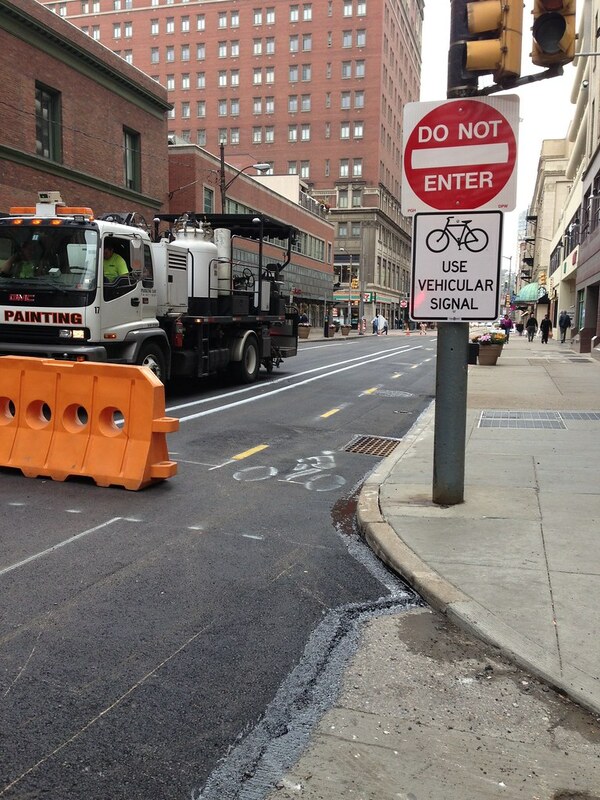 Last year when most of the bike lane was put in, PWSA discovered that one of the pipes running under that block needed to be repaired before the street could be milled and repaved. That work was done earlier this year. Recently, DPW milled the section from Sixth to Stanwix Streets and discovered trolley tracks near the surface. Unfortunately, the trolley tracks are so close to the road surface that, if they are paved over, the asphalt will easily erode from the wear and tear of car traffic. The solution? The trolley tracks have to be dug up and removed before the road can be paved and striped for the bike lane. When will the job be done? Hopefully, before winter. This is at least the second time construction has, “uncovered” trolley tracks, the other one being the Penn Avenue fustercluck of a project in Garfield. I understand trolleys were removed quite quickly, but wouldn’t there be some form of database where old trolley tracks were? We have had a piece of technology known as a metal detector, capable of finding a single silver dime at a depth of two feet. You would think that PennDOT, or one of its contractors, would be able to find a 100-pound piece of iron rail at a depth of a few inches, by using such a device. Well, at least they are removing the rails and they’re seemingly trying to do this the right way. New DPW paving schedule lists Penn Avenue to be paved on the 15th starting at 6pm. On biking down S. Milvalle Avenue the other day, turning right onto the road from Liberty (headed towards oakland) there are trolley tracks exposed there. Bad news for the next time they pave this. I wish the City would simply make Penn Ave one way now instead of waiting for the road to be repaved and for the cycle track to be put in. That way people can start getting used to this arrangement. FWIW, this change has been communicated to Google Maps. Right now, it will not allow you to plan a car route that makes you go eastbound on Penn on these last two blocks. It does allow you to plan such a route using a bike. Also worth noting is that Google Maps will also not allow you to plan a car route that goes northbound on 6th St between Liberty Ave and Penn, while allowing you to plan this using a bike. I seriously doubt that the City will make that short section of 6th St one way, so this is probably a mistake. Paving began last night. It’s far from over, though. Anybody else find it odd that the map attached to the mayor’s press release includes as ‘existing bike infrastructure’ a selection of unmarked paths through Point State Park, but not the posted Smithfield Street bridge and Fort Pitt Boulevard “shared use paths” ? Well, other than the green bits of Penn and maybe 6th, the rest is all “shared” if you count the peds. (And if you do, there’s way more green than shown.) Maybe there should have been three colors… (no, this is not an invitation to a discussion; just a musing). Does “Use vehicular signal” mean you shouldn’t run over any peds? I could live with that (though a mindful biker would certainly respect their priority as they slowly make their way across the intersection, perhaps with a foot on the ground). My guess is that the next few days are going to be confusing for a lot of drivers in this area, so be careful when riding on this stretch of road. Rode it this morning, and I did see one car driving on the bike lane, but they were out of the way before I got there. I am concerned by the light stenciling at the Stanwix end, however, which tell bikes to merge into the main traffic lane before getting to the intersection. Why would they do that? and how are bikes supposed to get into the bike lane from Stanwix? @willb I agree that the stencil at the end of the cycle track is a little concerning. I think they are trying for westbound cyclists to merge with traffic here to avoid getting left hooked. I’ve encountered many times drivers that fail to yield to me when I’m walking across Stanwix (with the walk sign on) when he/she is turning left from Penn onto Stanwix. If you are going straight towards PSP, the safest maneuver is to merge before you reach the intersection. Cyclists should have no issue making a right turn from northbound Stanwix onto eastbound Penn. A left turn from southbound Stanwix onto Penn might be trickier, especially considering that there is no proper turn lane here, though this is arguably a rare occurrence, as most of the traffic traveling southbound at this point is coming from the Parkway via Ft. Duquesne Blvd. That being said, if the bollards are not installed all the way up to Stanwix, there will be numerous drivers attempting to turn into Penn with no physical barrier to “prevent” them from doing this. Simply putting up signs won’t be enough. I found myself a bit flummoxed as I approached the Stanwix corner. True, not having paint or bollards does present the issue of “OK, now what?”. * Going straight toward Point State Park and the Ft Duq Bridge, I would have to cross motor traffic turning left, and then somehow merge into forward traffic, which if it is moving at all, is moving quickly, and if it isn’t, then I would be faced with filtering. * Going right — which admittedly is not going to be a lot of us, just people like me headed for an outbound O1 or O12, first boarded on Stanwix just before this corner — looks very difficult. I did not encounter oncoming car traffic on my one pass. Neither did I stick around to count those who did. This was about noon. I rode the Penn Ave bike lane today. There were sawhorses blocking the lane for both bikes and cars – which is probably a great thing to do until all the markings/ wands are in place.